previously known as Ama Kōhei, is a sumo wrestler. He is a yokozuna, sumo's highest rank, receiving his promotion September 26, 2012, the third consecutive Mongolian and fifth overall foreign-born wrestler to attain that exalted rank. He began his professional career in 2001 and reached the top makuuchi division in 2004. 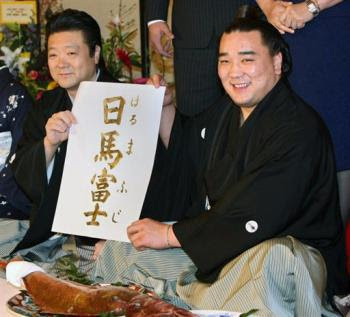 In November 2008 he became the seventh foreign-born wrestler in sumo history to reach the second highest rank of ōzeki. In May 2009, he won his first championship, winning the Natsu Basho (May tournament). He won the championship for the second consecutive time with a perfect record, and fourth time overall, in the 2012 September Aki Basho. Byambadorj is a native of Ulan Bator, Mongolia. His father was a Mongolian wrestler, holding a rank roughly equivalent to sumo's sekiwake. He appeared at the Naadam, a Mongolian games festival that includes wrestling, at the age of 15. He was scouted by Ajigawa-oyakata in July 2000 and subsequently joined Ajigawa stable (now Isegahama stable). He took the fighting name Ama and made his first appearance in January 2001. He reached the top makuuchi division in November 2004, rising slowly to komusubi in May 2006. However, a disappointing 4–11 result in this tournament sent him back to the maegashira ranks. ***** . Japanese Wrestling (sumo, sumoo 相撲 ).